We are excited to offer a unique experience for those suffering from respiratory illnesses and skin conditions. 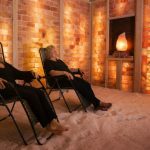 At Himalayan Hideaway Salt Cave, we are excited to offer a unique experience for those with chronic conditions and illnesses affecting the respiratory tract and skin. With salt therapy, also known as halotherapy, salt is dispersed into the air in a salt cave environment, where the body naturally stabilizes and restores itself naturally. Salt can balance out the positive charge in our bodies by binding excessive positive ions in the air with the salt’s negative ions. This neutralizing force cancels out harmful electromagnetic vibrations in our environment and in the body. Therefore, salt therapy has de-stressing and relaxing effects! Each visit to our salt cave offers the opportunity to enjoy a comfortable and relaxing environment, as well as relief for those suffering from chronic bronchitis, trouble breathing, respiratory diseases, asthma, allergies, fibrosis, and more. Guests who visit for halotherapy regularly will see great improvements in their symptoms and will be on the path to greater wellbeing in Winston-Salem, North Carolina. The number of treatments for different conditions may vary according to severity, the type of ailment, and other extenuating medical circumstances. 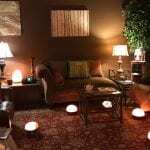 At Himalayan Hideaway Salt Cave, we can answer your questions, provide guidance about the number of visits that may work best, and guide you through our salt therapy products and Himalayan salt lamps to use at home in between sessions. Whether you are looking for holistic wellness or you simply want to detox and de-stress, you’ll find great benefits at Himalayan Hideaway Salt Cave! Contact us today to schedule a session and to learn more about the benefits of halotherapy.